Commercial cleaning is a powerful driving force that often times takes place behind the scenes in the Massachusetts work industry. 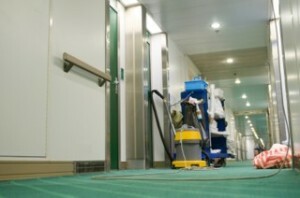 At night, top notch cleaning crews enter buildings and perform janitorial duties. Their mission is to achieve high quality cleanliness and sanitized surfaces for the office’s beauty and protection of the employees. Lack of cleaning can put employees at risk for catching flu germs or sickness. More sick days means less success. The safety of employees should not be compromised by dirty work surfaces and a germy facility. Cleaning is so important in making sure the office atmosphere is healthy and sanitized. Taking action by incorporating a cleaning routine will improve the condition of a commercial property. In Massachusetts, office janitors strive to maintain cleanliness with consistent professional quality care. Nightly duties typically include restroom cleaning, trash removal, dusting, vacuuming, floor care, and more. Involving these actions will sustain a commercial property’s appearance. When employees go home at night, the next phase of action takes place behind the scenes. Nightly cleaning is commonly practiced because it’s less disruptive for offices if the cleaners were to be there during a company’s work hours. Cleaners come in motivated to work hard and perform their janitorial tasks to ensure the office staff will enter into a beautiful and nice smelling place. To learn more about Apple Corps professional cleaning services, call us today at 781-335-6900. Our experienced cleaners provide janitorial services to office buildings, industrial facilities, schools, car dealerships, churches, and more.